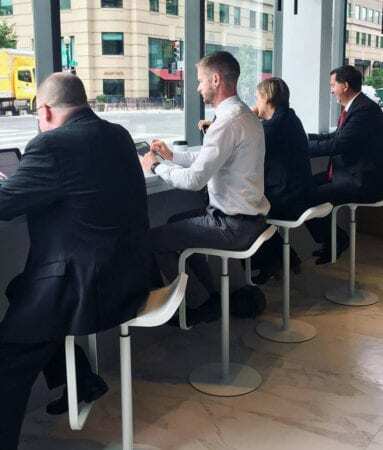 Besides the moveable walls and coffee bar, the branch also offers free Wi-Fi, iPad stations, a full conference room with state-of-the-art video conferencing, and a projection screen. Signal plans to open the space after hours to host various events like art shows, seminars, business meetings, community events, etc. Signal’s new City Center location is of the few credit union branches in downtown Washington that is open to the public and not housed in an access-controlled building. It is a full-service credit union branch, includes a 24-hour ATM vestibule, and will operate from 9 a.m. to 4 p.m. Monday through Thursday and 9 a.m. to 5 p.m. on Friday. A Grand Opening celebration week is planned for November 6–10 during branch hours. Members and the public are invited to stop in to see the new branch and learn more about Signal. More information about the branch can be found here: www.signalfinancialfcu.org/citycenter.